and Lavan said to him, “Nonetheless are my bone and flesh.” and he had stayed with him a month’s time. Lavan said, “It is not the practice in our place to give the younger before the older. You did not even let me kiss my sons and daughters! It was a foolish thing for you to do. When we met Lavan for the first time back in Parshas Chayei Sarah while his sister Rivkah Imeinu was being recruited to become a wife for Yitzchak Avinu, on the surface, he seemed like a relatively decent and even welcoming individual. Even when we reach Parshas Vayeitzei, he doesn’t seem like the absolutely worst individual around. He certainly does engage in some sketchy behaviors, however, he, more or less, seems to have some concern for what’s right and fair. Of course, Chazzal have scrutinized Lavan’s ways, seen through Lavan’s façade and have exposed him for the faker and deceiver that he truly was. Even without Chazzal’s scrutiny, there is enough evidence in the Torah that Lavan’s behavior is at least incorrect, from Lavan’s switching of the wives on Yaakov Avinu to his switching of Yaakov’s wages, and to violating the explicit word of G-d not to pursue Yaakov. He’s not the greatest guy. The question is: What makes Lavan different from Yaakov Avinu? Now, at first glance, this question sounds utterly ridiculous. Yaakov Avinu is our wholesome forefather and an undoubted Tzaddik (righteous one). There’s a reason why Hashem has allowed him to inherit what would become His chosen people. Lavan, on the other hand, is a maybe somewhat decent but certainly controversial individual at best, and a greedy, idolatrous, and scandalous opportunist at worst. The two cannot be more different. This overall assessment is a fair one. Unquestionably, Yaakov clearly has way more redeeming qualities than Lavan does and the two stand on completely different wavelengths on the moral and spiritual spectrum. All of that being said, like Lavan, Yaakov Avinu was somewhat of a practitioner of the art of conning and deception. Yaakov, in some respects, schemed Eisav by convincing him to sell his birthright, and later, albeit according to Rivkah’s counsel, he tricked his blind father Yitzchak into giving him Eisav’s blessing. In fact, Chazzal teach that when talking to his soon-to-be-wife at the time, Lavan’s daughter Rochel, Yaakov told her that if Lavan plans to deceive him, he too could “walk the walk” and be Lavan’s “brother in deception” [Rashi to 29:12 citing Bereishis Rabbah 70:13]. In other words, it sounds like Yaakov was prepared to tango with Lavan, perhaps scheme him back. Considering that Yaakov was not only capable and well equipped, but was experienced in such a craft as deception, was he, in this regard, any better than Lavan? True, Yaakov was an all-around better person and a more righteous individual. We get that. But we can’t completely ignore this big gray elephant in Yaakov’s life, the apparent dishonesty. Would we say that in this one area, Yaakov was any better than Lavan? Is dishonesty, no matter what the situation, not dishonesty? Maybe Lavan lied more often, and perhaps that would make Lavan a worse individual than Yaakov. But should this quality of dishonesty which Chazzal take Lavan to task for, be any less a character flaw in Yaakov Avinu? How is Yaakov different? Obviously, we’d love to say that Yaakov is different, but is there any evidence? We could suggest that the difference between Yaakov and Lavan is more than the mere fact that Yaakov is existentially “more righteous” than Lavan and that he “lied less” or “fewer times” than Lavan did. Their respective characters and even the nature of their respective traces of dishonesty are worlds apart. While Yaakov did display some form of dishonesty, Lavan’s personal craft and way of life was dishonesty. It was not just the quantity of Lavan’s lies that make him different, but the role of lies in Lavan’s being. Lavan, like a modern politician, was not only comfortable and fluent in his lying, but he had the audacity to claim the moral high ground every single time he was caught in the wrong. In doing so, Lavan would inappropriately manipulate every situation in a way that best fancied him while presenting it as pure justice. One can begin to see Lavan’s craft when he meets Yaakov in Charan. Lavan welcomes Yaakov with open arms as if he is family, and then puts him to work without receiving any kind of acquiescence from him, almost as if it was presumed that he was going to work for him, as if there were no options. Then Lavan has the gall to say [29:15], “Hachi Achi Atah VaAvadtani Chinam?”-“Is it just because you are my brother that you should serve me for free?” as if to make himself look generous for paying Yaakov a few bucks despite the fact that he is superimposing this labor on his emptyhanded nephew. Bear in mind, Lavan did not lie here, but he dominated a poor family member using his words, power, and righteousness demeanor. In this particular scene alone, it’s just fishy, but fast-forward to the wedding when Yaakov is supposed to marry Rochel but then Lavan switches her with Leah. When Yaakov asks Lavan why he tricked him, Lavan, again, puts on the halo and justifies his actions because “It is not done in our place to give the younger before the elder” [29:26]. Even if lying was justified here, which it wasn’t, Lavan could have done the next to most honorable thing here and just allowed Yaakov to marry Rochel without having to pay him back another seven years of labor, but of course, that didn’t happen. When Yaakov wants to leave, we see the rhetoric of Lavan in action once again, when Lavan basically begs and finally convinces Yaakov to stay longer and convinces him to name his price, Lavan responds [30:34], “Hein Lu Yehi Chidvarecha”-“Yes [behold], if only it shall be like your word,” as if he’s suspecting Yaakov of planning to take advantage or retract on the deal which Lavan desperately pushed, when indeed, we know Lavan ultimately takes advantage and retracts on the deal several times! Perhaps the most telling scene is when Lavan pursues Yaakov and wrongly accuses Yaakov of stealing his Trophim (loosely translated: idols) [31:22-30]. Just forget for a moment that Lavan ignored G-d’s explicit command that he not speak to Yaakov at all, “whether for good or for evil,” [31:24]. 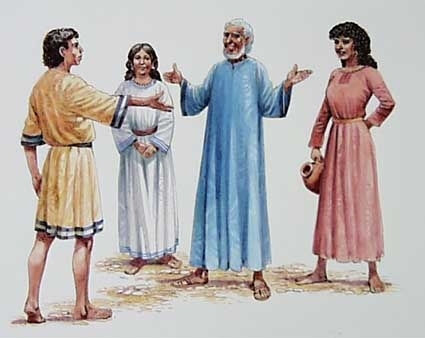 In this part of the story, Lavan blasts Yaakov with a full tirade about how he has deceived him, how Yaakov has taken Lavan’s grandkids away without letting him say his goodbyes and escorting them with parade, and of course, how Yaakov has stolen his property. Now, granted, Yaakov might’ve been somewhat guilty for part of his long accusation—certainly not all of it—but notice how Lavan is not merely accusing Yaakov of a single crime, but of being a liar and a deceiver all around, when in truth, Yaakov has been so pathetically loyal and faithful for the years he has known Lavan, while Lavan not only cheated him relentlessly, but again, claimed the moral high ground every step of the way. At this point, Yaakov doesn’t take Lavan’s condescending, self-righteous rhetoric, but he lashes back, rightfully so, because at this point, it is apparent to Yaakov that Lavan’s narcissism has exploded to a new level of absurdity. Yaakov was not in the wrong. Lavan, although he refused to admit it, certainly was in the wrong. Yes, Yaakov might’ve “conned” Eisav, but he didn’t make Eisav insult the birthright. That was Eisav’s decision. And, yes, Yaakov might have lied to his father when told to do so by his mother, but, at no point do we see Yaakov justifying his actions! In fact Chazzal indicate that, on the contrary, Yaakov was particularly uncomfortable with being in a situation where he had to lie, explaining how each of the “lies” in Yaakov’s speech were presented in such a way that he wasn’t blatantly lying [See Rashi to 27:19 citing Tanchuma Yashan 10 and to 27:24 citing Bereishis Rabbasi]. This is all beside the point that Yaakov might’ve been justified in this very sensitive situation (a separate debate). Either way, it was the situation more than anything else that triggered Yaakov’s dishonesty, not Yaakov’s lacking in character. Indeed, as he demonstrates in his dealings with Lavan, Yaakov, as a person, was a faithful and honest man, so that despite the fact that he has been involved in some questionable situations in his life, Yaakov is known by Chazzal as a pillar of Emes, truth, no less than an individual who occasionally commits a sin can still be called a servant of G-d.
Lavan, on the contrary, although decent in appearance, was a conceited liar in his essence, so that even when was repeatedly caught red handed, he would whitewash his crimes and present them as noble ideals. This trait of Lavan’s would certainly explain the irony and deeper meaning of his name, “Lavan” which means “white.” The whiteness represents the pure, clean and innocence that Lavan advertised. But that’s exactly what it was—Lavan’s presentation! The whiteness may even represent who Lavan was in Lavan’s own eyes! Because in Lavan’s world, Lavan cannot be wrong. He switches wives on his son-in-law and he is still right! He changes wages on him and he is still right! He blatantly violates the word of G-d with full intention and he is still right! That was Lavan, always “white” and right. Unfortunately, it not only exists in the world, but it might exist a little bit in each of us. Of course, we have to be aware of this trait in others so that we’re not manipulated by them. But more importantly, we have to eradicate this trait in ourselves. We have to be honest both with others and with ourselves. We have to get off our high horse and stop claiming the moral high ground when maybe and perhaps likely, we’re just in the wrong. If we can drop the “white” façade and admit to being gray sometimes, then we won’t need to delude ourselves into being “right in our own eyes,” but we can, instead, be like Yaakov Avinu, individuals of truth doing what’s right in the real world, in G-d’s eyes. When we rid ourselves of self-righteousness, we can proceed on the less traveled path of actual righteousness. May we all be Zocheh to be protected from such negative Middos in the people around us, remove them from ourselves, and we should serve Hashem humbly and honestly according to the ideals of the Toras Emes, and Hashem should reveal the ultimate light of truth and righteousness to the world with the coming of Moshiach, Bimheirah Biyomeinu! Have a Great Shabbos!